Home / What Do You Do with Sawdust and Wood Scraps? Tossing your sawdust and scraps in the trash isn’t the most environmentally friendly way to declutter. The best strategy is to plan your purchases so you have as little scrap as possible – but no matter how hard you try, you’re still going to have little bits and pieces to offload. If you’re at a loss for ideas, here are a few things you can do with your sawdust and scraps to keep them out of a landfill and give them new life. If you have larger scraps that you aren’t using, consider donating them to a charity. Habitat for Humanity can always make use of building materials, and the items they can’t use go to their ReStores – home improvement thrift stores, the profits of which further go to funding their mission of providing affordable housing to low income families. Smaller scraps and soft woods can find new life at the hands of youth programs. Your local scouting organizations can almost always use wood for a project, be it community improvement or crafts or working toward a merit badge. If scouting is a bust, call around to your local schools with shop classes or make contact with the activities coordinators at nursing homes and assisted living facilities to see if they can make use of your extra wood. Check with your local recycling facilities to see if they’ll accept sawdust, wood chips and shavings. If you have a local program that creates mulch, these items are in high demand – unless you’re working with woods that are phytotoxic to plants (for example, walnut and cedar). If your local recycling facility isn’t equipped to handle excess wood, offer it up on sales groups and networking groups like Craigslist or Freecycle: plenty of gardeners can use sawdust in their compost, and shavings, scraps and chips can be incorporated into landscaping. Sawdust is a pain in the neck to clean up, but it can actually help you keep your workspace and home clean. If you’ve got small children or someone in your home with a shaky stomach, sawdust is the perfect material to absorb vomit. In the workshop, a pile of moist sawdust can be swept across the floor to absorb fine particulates and grime. While it’ll still go in the trash afterward, at least it’s been put to good use. A little bit of wood glue and a pile of scraps, as well as your latent creativity, can make for some nifty scrap wood projects. Mosaic style jewelry or trinket boxes, planter boxes and even chairs can be cobbled together from scraps from your workshop. If you have no use for the finished objects, give them as gifts, sell them at your local craft fair or flea market or donate them to someone who can use them. No scrap is too small for use — sawdust included. If you’re keen on giving new life to your scraps, consider a craft project to get your creative juices flowing. You can find new uses for sawdust and scraps around your home, including cleaning and organizing. If you’d rather offload your scraps and dust, consider donating them to an organization that can make good use of them. Sawdust gets tossed into one of my four compost bins and scraps end up in the fireplace. I melt old candles and mix the wax with the saw dust to make fire starters for the stove. Mix the melted wax with the saw dust in a coffee can and dump into an old 9″x9″ baking dish. Compress and let stand over night. The waxed form should pop out of the dih and can be cut into squares on the band saw. Can be used for camping also. I found a ceramics school near me and give them all of the dust from the sawdust collector for doing their Raku style of pottery. Other than that, there are a few neighborhood gardeners that use it for their mulch but the ceramics school is my main “customer”! Whatever happened to putting chips, shavings, router debris, sawdust, and sanding dust directly on your garden or compost pile, or give to a friend who gardens if you don’t??? Another use for saw dust and lathe shavings. Both my neighbor and my Doctor have chickens. Saw dust and shavings are great for the chicken yard. Sawdust—I hate grass, actually I hate cutting grass so we have been using a “lasagna” method over the past few years to reduce our grass footprint. Lay down cardboard, spread a 3″ to 4″ layer of sawdust then another layer of stuff my wife has delivered –3 or 4 yards at a time. Scrap/cutoffs etc. I heat my studio with wood. Needless to say the insurance folks frown on a wood stove in a wood shop so I’m careful & have 3 up to date fire extinguishes at the ready. My wood-fired boiler takes care of disposal of sawdust/planer shavings/scraps, at least during the colder months of the year (I’m in Minnesota) and that’s when I do most of my wood working. It’s also a great place to put oily rags. Even in the summer, if I happen to have some shop cloths or rags with oil I place then in the firebox of the boiler. If they heat up and catch fire, that’s not a safety concern. I have a lot of cedar and redwood sawdust from router carving signs and such. I bring it all up to my cabin and keep a 5 gal container in the outdoor privy to compost with. Keeps the smell away extremely well. I give my wood shavings from lathe turning to a potter who uses it for firing her pots. Small to medium sized scraps of clean non-toxic woods go into my wood burning grill for making dinner! Saw dust and planner chips either get used as cleaning aid as mentioned above (they are also great for soaking up oil spills) or added to my mulch pile to feed my garden. I use sawdust and glue to fill small cracks and holes. I pour the glue and rub the sawdust in crack or hole and it is stronger than wood putty and a better match. 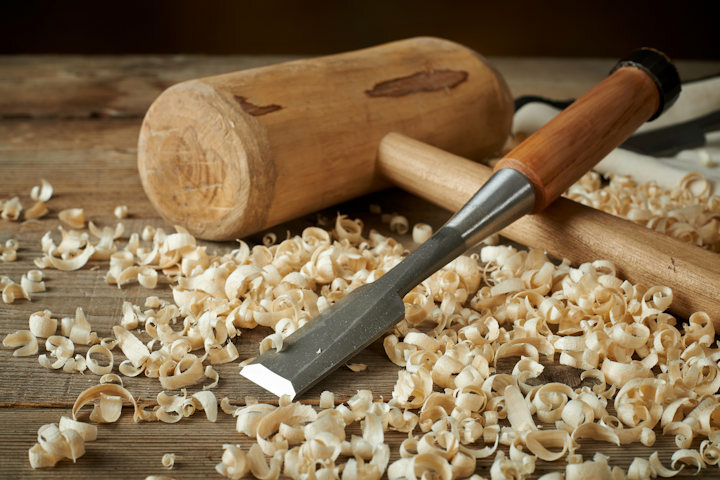 Being an avid wood turner, I “produce” lots of sawdust and woodscraps. My sawdust goes into a pile outback to decompose. My wife then uses it as mulch in her flower beds. Note I said “Mulch,” and not “Compost.” You know the difference. We have some problems in our town that is killing off Walnut trees. Some of the tree services will give you the wood so that it does not go to the landfill. I mix sawdust and shavings with newspaper and water, then compress them in to firelogs with a device I found on Amazon called a “paper log maker”. I’m glad this post mentions composting sawdust as a recommended disposal because I’ve been doing this for a while but not really knowing if it was a good thing to do or not. I mean, it seems like it should be fine unless it’s treated lumber. I am a woodturner and I have a friend who is a potter. One process she uses is called pit firing. She builds a fire in a pit in the ground and places her bisked pots in my wood chips and other burnable materials. During the firing the different types of woods give off gasses that produce randome designs and beautiful colors on the surface of her pots. Very nice results when she removes the pots after the pit has cooled down. Our solid lumber shavings and saw dust go into a dump trailer and is sold to a horse boarding place. Only disadvantage is that the trailer has to be pulled out any time walnut is processed. Scrap wood goes to a local boy scout camp for their camp fires. We have a separate dust collector for the panel processing area, that and the composite scraps go to the landfill.